Walking among giants; redwood forests, California; photo by Stefan Geens on Flickr (noncommercial use permitted with attribution / share alike). The giant sequoia is the most massive tree in the world, with 30- foot diameter trunks not uncommon. They reach ages of over 3,000 years. 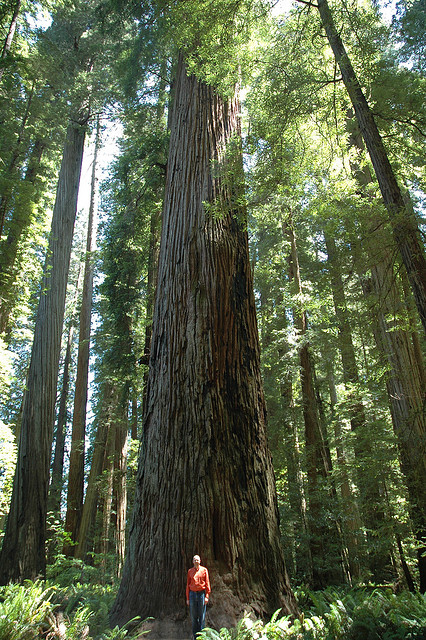 The coast redwood is the tallest tree in the world, averaging about 300 feet high. The oldest known redwood trees lived to be 2,200 years old. There are actually more redwood trees today than during settlement of the nation - the change is in the age class of the trees. In the mid - 1700's, original coast redwoods covered nearly 2 million acres. Since then 96 percent of that magnificent old growth forest has been harvested - just 4 percent remains today for us to protect. Over 95% of the remaining old growth forest is under the protection of parks and reserves: 257,000 acres in California parks and another 125,000 acres on public land (in both, harvesting of redwood trees is prohibited).